a) epiglottis; b) aperture of the glottis; c) arytenoid muscles; d) trachea. The larynx, known commonly as the voice box or "Adam's apple," is an organ in the neck of humans and other mammals that is involved in the production of sound and also serves to protect the upper part of the trachea (windpipe). The larynx houses the vocal folds (vocal chords) and is shaped like a funnel, with walls of cartilage and a highly complicated system of muscles. It lies just below where the tract of the pharynx splits into the trachea and the esophagus, extending from the fourth to the sixth vertebral levels. These cartilages are connected to each other by muscles and ligaments and lined with mucous membrane. Movement of the cartilages alters the tension of the vocal folds, which changes the pitch of the sound emitted by the vocal folds when they vibrate. The larynx is the upper, expanded portion of the trachea which is specially modified for the production of the voice. Its walls are composed of cartilages, ligaments, membranes, and muscles, and it has an internal lining of mucous membrane. The larynx is placed in the upper part of the front of the neck, where it forms a marked projection. It lies below the hyoid bone and tongue, and is directly continuous with the trachea inferiorly. Anteriorly it is covered by skin and faciae, and, on each side of the median plane, by two thin strata of muscles – the sternohyoid and omohyoid, and the sternothyroid and thyrohyoid. Frequently a narrow process of the thyroid gland, termed the pyramidal lobe, is continued upwards on its anterior surface. On each side a lobe of the thyroid gland is prolonged upwards on it, deep to the muscles; and it is related to the great vessels of the neck. Posteriorly it is in relation to the pharynx, which separates it from the prevertebral muscles. If the tip of the epiglottis is taken as its upper limit, the larynx, in the adult, is in front of the third, fourth, fifth, and sixth cervical vertebrae; but the position is not fixed: it varies with the movements of the head, and also during degluititon and phonation. The cavity of the larynx is smaller than might be expected from the outside. It is subdivided onto three portions by two pairs of elevated folds of mucous membrane which extend anteroposteriorly, and project inwards from the sides of the cavity. The upper pair of folds are called the vestibular folds; the lower pair are the vocal folds. 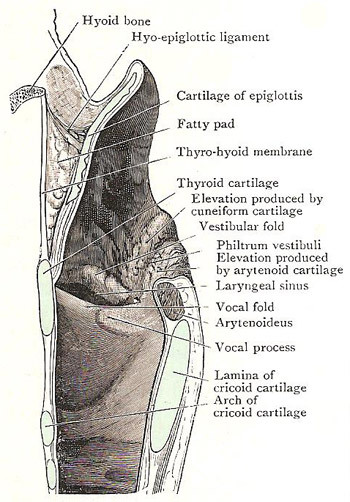 The vocal folds are the chief agents in the production of the voice, and the larynx is so constructed that changes in their relative position, and in their degree of tension, are brought about by the action of the muscles and the recoil of the elastic ligaments. The upper subdivision is the vestibule of the larynx. 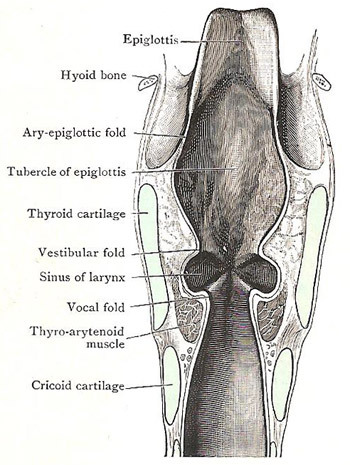 It extends from the inlet of the larynx down to the vestibular folds. The lower part of the vestibule is compressed from side to side, and its width therefore diminishes from above downwards. Owing to the obliquity of the inlet, the anterior wall is longer than the posterior. The anterior wall is the epiglottis and the thyroepiglottic ligament – both covered with mucous membrane. Each side wall of the vestibule is the aryepiglottic fold of mucous membrane; for the most part the mucous membrane is smooth and slightly concave, but in its posterior part ut bulges medially in the form of two vertical elevations, one behind the other. The anterior elevation is formed by the enclosed cuneiform cartilage and a mass of glands associated with it; the posterior elevation is due to the anterior margin of the arytenoid cartilage and the corniculate cartilage. A shallow groove (sometimes called the philtrum vestibuli) descends between the two elevations; it terminates below by running into the interval between the vestibular and vocal folds. The posterior wall of the vestibule is small and is small and is formed by the interarytenoid fold of mucous membrane. The epiglottis is set behind the median thyrohyoid ligament, the hyoid bone, and the back of the tongue. Its anterior surface is free only in its upper part, which is connected with the tongue by the glossoepiglottic fold. The posterior surface of the epiglottis is free, and forms the greater part of the anterior boundary of the vestibule of the larynx. The upper part of this surface is convex, owing to the manner in which the upper margin is curved towards the tongue; below the convexity there is a slight concavity; and still lower there is a marked bulging, called the epiglottic tubercle, which is a conspicuous object in laryngoscopic examinations. 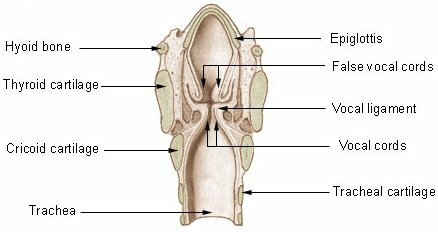 Each aryepiglottic fold of mucous membrane encloses some areolar tissue, the aryepiglottic muscle, and, posteriorly, the cuneiform cartilage, and the corniculate cartilage, which surmounts the arytenoid cartilage. The two small nodules of cartilage produce elevations on the medial layer of the posterior part of the aryepiglottic fold, which are easily seen when the larynx is examined with the laryngoscope. This the smallest of the three sections. It is bounded above by the vestibular folds, and by the vocal folds below. 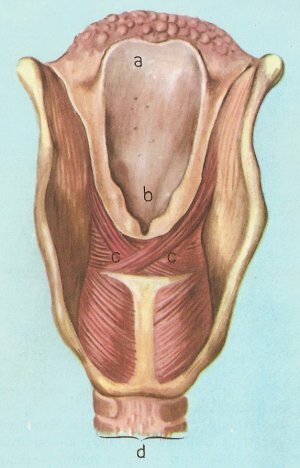 The part of the cavity below the rima glottidis leads directly downwards into the trachea. Above, it is narrow and compressed from side to side, but it gradually widens out until in its lowest part it is circular. It is bounded by the mucous membrane which covers the inner surfaces of the cricoid cartilage and the cricovocal membrane, between the cricoid and the vocal ligament. It is through the anterior wall of the lowest compartment of the larynx that the opening is made in the operation of laryngotomy. Over the posterior surface of the epiglottis, the mucous membrane is closely adherent, but elsewhere, above the level of the vocal folds, it is attached loosely by submucous tissue to the adjacent structures. As it passes over the vocal folds, it is very thin and tightly bound down, and in inflammatory conditions of the larynx, attended with edema, that attachment usually prevents the infiltration of the submucous tissue from extending downwards below the rima glottidis. The mucous membrane is covered with stratified epithelium on the vocal folds and the upper parts of the epiglottis and aryepiglottic folds; elsewhere with columnar epithelium. It has a plentiful supply of racemose glands which secrete mucus, but in the vocal folds they are completely absent. The most important function of the larynx is to prevent choking. When a person is not eating or drinking, the epiglottis remains upright, keeping the larynx open as part of the airway to the lungs. As soon as swallowing begins, the epiglottis descends like a lid over the larynx, directing food to either side. Closure of the vocal folds also helps protect the airway. The food or drink then passes down the esophagus to the stomach. The secondary function of the larynx is voice production. The opening of the larynx, i.e., the space between the vocal folds is called the glottis. When at rest, and with normal breathing, it is a triangular orifice through which air passes freely. When a sound is to be made, the arytenoid muscles (see artwork) act so as to twist the arytenoid cartilages, and these stretch or slacken the vocal folds, which can assume about 170 different positions. At the same time, the glottis itself is narrowed to a slit, the size of which regulates the rate at which air passes through the larynx from the lungs. The accurately controlled current of air makes the vocal folds vibrate, and so sounds are produced. As produced by the vocal folds these sounds would be too weak and faint to be heard, but the hollows of the respiratory system, in the trachea, the pharynx, the larynx itself, and the nose and mouth, act as resonators which strengthen and modify the sound. The chest also acts as a resonator and amplifies the sound just as the body of a violin does. In the case of humans, the sounds of the voice can be shaped to form words, which are made up of vowels and consonants. The shaping is done by the muscles of the mouth, palate, lips, and tongue. Vowels are accompanied by vibration of the larynx and the sound passes unobstructed through the mouth. Consonants are formed mainly by the alteration of the laryngeal sound by the tongue, teeth, lips, and palate. A word cannot be made up of consonants alone, because most of these cannot be voiced unless a vowel precedes or follows them. Some consonants are called labials (Latin labia, lip) because they are formed by the lips; it is impossible to say b, p, f, m, or v with your mouth alone. Others (d, t, l, n, r, s, z, ch, j) are linguals, requiring the use of the tongue (Latin lingua, tongue). G, q, and k are gutterals, made with the back of the palate (Latin gutter, throat). The pitch of the voice depends on the frequency of vibrations of the vocal folds. If they are at normal tension the vibrations are about 80 per second; if the cords are tightly stretched they are more rapid, up to 1,000 per second.